The lens in your eye can become cloudy as you age, making it harder for you to see. This natural clouding of the lens is called a Cataract. To correct this condition, a cataract can be removed and replaced with an Intraocular Lens (lOL). This procedure is done one eye at a time. Over the time, Cataract can affect your vision and they may end up limiting your activities and ability to enjoy life. Alike Camera, our Eyes too use lens to focus on an image. If your lens becomes cloudy we find it very hard to view the world. Advanced cataract surgery allows the surgeon to reduce the dependency on glasses or contact lenses. With the latest technology, Lensar Laser System Cataract surgery can safely remove the Cataract and implant a replacement Lens to restore the vision. How Does LENSAR improve Advanced Cataract Procedure? The LENSAR Laser System allows more precise Cataract removal procedure that is customized to your eye. Augmented Reality, a unique imaging system provides a reconstructed 3-D view of your eye, allowing for more safe and accurate information in order to help plan and treat your cataract. With Augmented Reality, a surgeon can see everything inside your eye in greater detail. Surgeon can precisely place Laser pulses that effectively soften the cataract for removal, and ensure the appropriate condition for the most accurate placement of your intraocular lens. 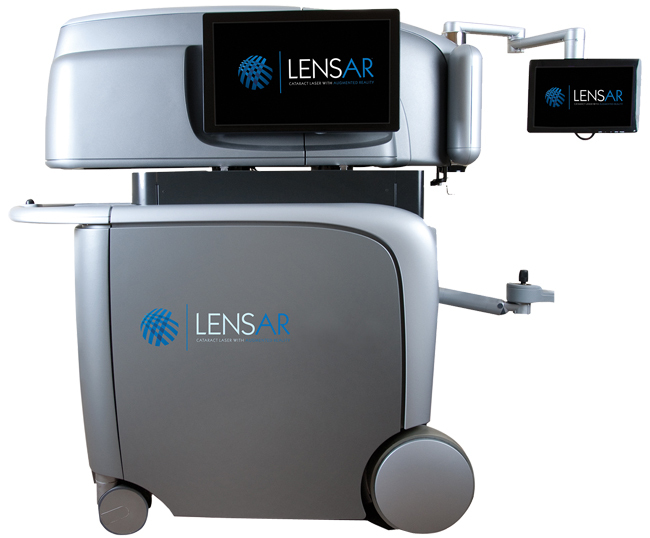 Lensar Laser System Cataract surgery is safe, effective proven Laser technology. It allows to precisely placing laser pulses that effectively soften your cataract for removal, and ensures the appropriate condition for the best lens placement, helping to restore your vision to its full potential. A unique high resolution 3-D model of your Eye which is customized to improve visual outcomes. The advanced technology available which can reduce the time to remove the Cataract. LENSAR’s precision, imaging and Laser incisions allow the Surgeon to ensure that the Cataract is safely removed and new intraocular lens is perfectly placed in the Eye. With an advanced laser cataract procedure, you can relax, knowing you have the latest technology available to treat one of your most valuable senses-your sight.